In approximately 1 hour and 40 minutes, it will be the official start of National Novel Writing Month, or NaNoWriMo. (Yes Erik, you were right ;)). NaNoWriMo is a crazy, crazy project. Participants sign up to write an entire novel--yes, an entire novel--in one month. That's 50,000 words in 30 days. The point of NaNo is not to write a good novel. It's actually to turn off your internal editor and nay-sayer and just put 50k words on paper (er, screen) without worrying about whether or not it's...you know...good. It's all about quantity, quantity, quantity. NaNo was started in 1999 and has happened every November since then. In 2006, there were over 79,000 participants, and over 13,000 of them "won" (which is to say--finished their novels). There's a huge online community surrounding it as well as local communities. Everyone supports each other and cheers each other on. I've already met with 4 other North Orange County NaNoers and tomorrow will be meeting up with a handful of others for my first official "write-in," which is where you sit in Starbucks as a group and write. This is my first NaNo and I'm very excited about it! The title of my novel is, "I Won't Be Home For Christmas." Follow my NaNo progress HERE! And be sure to take me to task if I'm not making any said progress :). Although don't take me to task if you read this on November 1st and I haven't updated anything yet. I start work at 6am and get off at 2:30 pm and will be taking a nap. Rest assured that I will be writing though! A while ago I wrote about "Happy Birthday Marf." It was an entry about someone I know online who ordered a cake at Safeway for her husband for his birthday and instead of "Happy Birthday Mark" the guy decorating the cake screwed up and wrote what looks like, "Happy Birthday Marf." While not quite as funny as Marf (I think it's probably even funnier to me because I've met Marf in person! ", there's this cake circulating on the internet. Some people that work here had a going away party the other day for a woman that is leaving. Hey, What's That New Widget? It's goodreads.com. Goodreads is a website where you can input what books you've read and rate and review them. I've been inputting mine completely at random, so the result is that most of the ones in my bookshelf are ones I really liked. Go over the goodreads, sign up, and be my friend! It's fun! Out of the blue I decided to Google my favorite high school teacher, Mr. Schwendemann, or Schwendy. Schwendy taught honor's history and I had him for 3 years. He was just an incredible teacher. He taught lecture-style--we never had a textbook, just lectures each day and a test after each unit. He retired shortly after I graduated, in part because of his "unconventional" teaching style (which honestly did more to prepare us for college than any other teacher I had). So I Googled him, thinking, "How many Glen Schwendemanns can there be?" Turns out there are two. Glen # 1 was apparently an academic who published widely on "Exodusters." Exodusters was a name given to black Americans who fled the Southern United States for Kansas in 1879 and 1880. Glen # 1 and his Exodusters was the first search results. However, I did find Schwendy right there 3 entries down, and it turns out that all this time he had a book bindery in his garage and collected, bound, and restored hundred of very rare and old books. WHO KNEW??? I do remember one day he had a book in class that was in a binding clamp, but that's about all I can think of. So I was very surprised to see that Schwendy donated 500 rare books to Cal State Dominguez Hills two years ago. The Glen Schwendemann Collection includes nearly 500 books, dated 1556-1990, and was donated to the library in 2005. Schwendemann, a retired Torrance history teacher and book binder, personally rebound and repaired over 300 of the books. Mr. Schwendemann's interest in rare book collecting reflects both his interest in historic exploration and excavation, and his skill at repairing books damaged by misuse or age. In his garage/book bindery, Schwendemann would de-acidify the book, sew the binding and cover the book with decorative paper and a leather, cloth or vellum casing. The books are both beautiful and useable thanks to Schwendemann's expertise. Topics in the collection cover a wide range, including European expeditions of the Arctic, Africa, South America and Tibet; ancient history; excavations and travel memoirs. It looks like the Hogan cabin in Green Valley Lake is safe! We're very relieved at that, yet so full of sorrow for all the families who lost their home during these horrific last few days. The wind here has stopped and our air is slowly clearing up. I'm finding it much easier to breathe, which is always a plus. Green Valley Lake itself will never be the same. I am so saddened by what we will see the next time we go up there. We're dealing with high winds and poor air quality here in Anaheim. The sad news is that things aren't looking so great for Kevin's grandparents' cabin in Green Valley Lake, CA. GVL is in the mountains and their cabin, which they built themselves, has served as a refuge for Hogans for decades. We have enjoyed our time there together. The dogs love the cabin--there's so much to sniff! And we've always enjoyed the solitude and relaxation. Unfortunately it's in the middle of a firestorm. At last report, 25 homes have been destroyed, many on the street we called "Digory's Favorite Street" because he goes nuts when we turn the corner there on a walk. Apparently it's the Best Sniffing In Green Valley Lake. It's really very scary and heartbreaking to see houses you recognize completely engulfed in flames. What's worse--they've evacuated all emergency personnel from the area. That means that they're not even fighting the fires anymore. Whatever will happen, will happen. All we can do is hope and pray that the cabin makes it out intact. It will be a huge loss for the Hogan family if we lose it. It's extremely windy right now--definitely the windiest I've ever seen Orange County. We are fine, however. There are fires in Orange County but not near where we live. Regardless, the air is thick and smokey. Our primary concern is our poor fence. It has needed to be replaced for some time now and since these winds are supposed to last a couple of days, I suspect that replacement may be sooner rather than later. Our next-door neighbor's fence went down the last big windstorm we had, and all of our fences were built at the same time out of the same material. It's really just a matter of time. But since Kevin just replaced the back and front stairs, it would be nice to have the fence hold up for a little while longer. For the time being, we're doing a visual check before letting the dogs out into the yard. Kevin and I went out to dinner tonight to California Asian Bistro, an Asian restaurant right near our local Costco. We'd eaten there once and it was really good, so decided to go again tonight. I can unequivocably say that it is awesome. They have an entire menu of Chinese food, another one of Japanese food, and a full sushi bar. Tonight I had the Sweet and Pungent Shrimp, after having asked what exactly they meant by "pungent." She said it was like sweet and sour sauce but more sour than sweet. I agree--it was delicious. I'm not always crazy about sweet and sour food because they tend to be more on the sweet glaze side which can get overwhelming after a couple of bites. The sweet and pungent shrimp turned out to be right up my alley. Kevin had the Hong Kong Style Beef Tenderloin Cubes, which according to the menu is, "Tenderloin cubes seared with pepper in black pepper sauce." It was really awesome too. I am not a huge fan of pepper since so many places overdo it, so the whole seared with pepper in a pepper sauce made me nervous--but needlessly. The beef cubes were so tender they practically melted in your mouth. We also ordered spring rolls for an appetizer (highly recommend too) and the Salt and Pepper Calamari. Unfortunately I wimped out on the calamari there and ordered it without spice (I'm very sensitive to spicy foods). It turns out it could have used at least a little bit of spice. Oops. It was much bigger than I expected, also. The chunks of calamari were substantial and the batter was very light. However, I had a classic case of eyes-bigger-than-stomach syndrome and we really could have done with just one appetizer. Anyway, if anyone is in the Fullerton/Anaheim area, I want to highly recommend California Asian Bistro. The prices are very reasonable too! Come and visit us and we'll take you there! Since Scout has had so many back problems, she is now forbidden from jumping, climbing, and pretty much anything that puts stress on her back (jumping up and down). This means that one of her favorite locations in our entire house, the couch and love seat, is no longer allowed. She cannot jump onto the bed, her former favorite location, anymore, and so we lift her up (what we call "elevator service") and down when she really wants to get up here. However, with the couches, she can physically get up there herself--she's just not allowed to. This has created some problems. We bought sheets and pinned them across the couches so that it looked like it was too high to jump onto. This worked very well...with Scout. Enter the Galoot. Digory can jump on just about anything--he's much bigger, taller, and stronger than Scout is. He jumps right up on the couch, collapses the sheet, and Scout says, "Oh, thank you!" and follows him up. Ugh. Another problem is the love seat, which is in front of the front window. Digory especially likes to look out this window and it has been hard to keep him from doing it. We finally piled up lots of cushions there and covered them with the sheet to prevent Digory from kicking them off (the actual height hasn't discouraged him at all--he's perfectly capable of jumping from the floor to the arm of the couch). Scout cannot get up there now, but that doesn't stop her from really, really wanting to. Especially when Daddy is gone. When Daddy is gone and Mommy is home, we must stare out the window until Daddy comes back. It's just the natural order of things. So you can see the dilemma if couch access is unavailable. So Scout tries her second solution--barking--to either 1) tell the couch to come down and make itself accessible to her, or 2) call me over so I'll come and pick her up and put her there. Neither happens, but Scout is steadfast. She just barks and barks and barks--and if you've ever lived with Scout you'll know what I mean when I say that she has a lot of staying power. She barked on and off for the last 2 hours while Kevin was shopping. Sheesh. It's actually pretty heartbreaking because she was formerly allowed up there and she really doesn't understand why she can't go up anymore. I feel so bad that she can't do something she really wants to do that I would otherwise not have a problem with. Since we don't watch television, we do watch a few selected series on DVD. The nice part is that if you wait long enough, you can just watch the episodes one after another, commercial-free! No waiting until next week! We've watched some fantastic series--Arrested Development, a genius show that was canceled; Futurama, a genius show that was canceled; Freaks and Geeks--canceled; etc. I think the only show that made it through its intended conclusion was Six Feet Under. Anyway, we just wrapped up another series, a British sitcom called Coupling. I have to say that on the whole I'm not a fan of "British humor." Some of it I find hilarious, but some of it just leaves me feeling kind of irritated. Coupling falls in the former category. In fact, in a couple of episodes I've laughed until tears fell down my face. The premise sounds suspiciously similar to Friends--3 guys and 3 girls, a group of friends, who meet primarily at a bar and basically recount dating and life challeneges. However, it's actually even funnier than Friends and there are quite a few differences. I can say, if you're ever looking for a new series, Coupling is a great one. The seasons are extremely short (this final season was 6 episodes long, at a half-hour each) so they're easy to digest. It's very, very funny. Go watch it. I read somewhere that a natural way to clear a clogged drain is to simply pour baking soda down it and then follow it up with some vinegar and then it all bubbles and looks super-cool until WOOSH! your clog is gone. Just so you know--save your baking soda for cookies or the inside of the refrigerator and go buy some Drano. The novel, she is finished. 28-year-old Carly Gantry has finally lost it. A completely unskilled and soon-to-be unemployed technical support representative, Carly spends much of her time dodging credit collection agencies and trying to get around the restrictions of the restraining order her ex-boyfriend has filed. Unfortunately, her half-hearted suicide attempt doesn’t earn her the love and attention she seeks. Instead it sets off a chain of events Carly is unable to control. Carly is thrown into the world of modern mental health care and learns firsthand how inadequate it truly is. In the hospital, she befriends Meryl, a fellow patient who has racked up so many hours in mental health treatment she deserves a frequent flier card. What Carly doesn’t know is that Meryl is far more troubled than she appears to be. The medical profession having failed her, Carly pins her hopes on Dr. Bob, a sportscaster-turned-pop psychologist and host of an extremely popular television talk show. Meryl sets Carly up to appear on the show but it’s not until the episode starts filming that Carly realizes exactly what Meryl has set her up for. After the taping, she leaves a number of extremely angry and hateful messages on Meryl’s voicemail and fervently hopes that her television appearance will be edited out. Upon arriving home, however, Carly learns that Meryl has taken her own life, and suddenly Carly’s world has been thrown upside-down. Still reeling from her friend’s death, Carly’s disastrous episode of the Dr. Bob Show airs and becomes a nationally televised study in humiliation and ridicule. That night, Carly’s mother, in the midst of a serious mental health episode, disappears from her house. Carly must go out and find her mother and in the process, find herself—picking up the crumbled pieces of her life and making her family whole again. We finally saw High School Musical two nights ago. I say "finally" because in my line of work, I am way the last person to see this. Now I need to see High School Musical 2. Not familiar with this movie gem? Let me fill you in. HIgh School Musical is a movie that played on the Disney Channel aimed at kids under 13. High School Musical is, like, this bizarre phenomenon amongst the tween crowd (a "tween" being approximately the ages of 8 to 12) and even younger. I could not believe the number of High School Musical t-shirts that come through my store daily, as well as the stuffed animals named after HSM characters or the actors who played them. Sharpay, a character, is probably #1 with Zac, an actor, coming in at #2. Guests are constantly asking us if we have any HSM paraphernalia (we do--a t-shirt that consistently sells out the day we get a new shipment in). It's amazing how many people have seen a made-for-television movie. And now, the plot. Essentially New Girl meets Jock at a New Year's party and ends up singing karaoke with him. Back to school, New Girl turns out to be a new girl in the school (cue "Summer lovin'...happened so fast"--not really, but exact same storyline). Jock decides he really likes to sing and he and New Girl inadvertantly try out for the winter musical, and of course are awarded the lead roles. Meanwhile there's this really important basketball game that Jock is supposed to play in and blah blah blah, they do both and are a smash hit. The end. Oh, and it's a musical. All in all I have to say that up to this point I was thinking, "What is it with this movie???" and was feeling kind of irritated about it. Then my friend Wendy said that she thought it was kinda cute, and it was refreshing to see little kids be into something quite wholesome for a change. I have to say--she was right. The music was catchy and fun, the storyline was a no-brainer but a classic, always appealing story, and the entire movie was just a lot of G-rated fun, which this country could use more of. Now on to High School Musical 2. It's hard to believe, but the biggest project of my life--the one that has been around 4 years in the making--is almost done. I'm talking about my novel. I have two and a half chapters left to go. I have vowed to finish it this month, partly in order to embark on another crazy project next month, but mostly because I'm almost done! I can taste it! However, don't get all excited about reading said novel once these two and a half chapters are done. It needs major revision, and following the advice of every single writer who's ever published a book and given advice1, I'm going to place this novel in a drawer for a while so that when I look at it again it will be with fresh eyes. 2unless I pay to publish it myself. Which is lame. I'm going to narrate our trip out of order because I want to start with the Best Excursion Ever--the dog sled and musher's camp. This excursion was in Juneau, Alaska, on the coldest, rainiest day of our trip. We ended up getting lucky with our excursion--almost all of the other excursions were cancelled due to weather and there were lots of unhappy cruise passengers milling around the boat. We headed out to a musher's camp in the middle of the woods somewhere. Once we got there, we realized why it was in the middle of the woods somewhere--the cacophony of barking. It was great. The mushers told us that barking is encouraged among the dogs--it gets them fired up and excited about running. Digory would have been in heaven! The dogs were probably the happiest pups I've ever seen. Coupled with their lavish diet and extraordinary amount of attention, I have to say that when I die, if I can't come back as a beagle in a cushy household like ours, I'd like to be a sled dog. The dogs, we learned, were Alaskan Huskies, which is not actually a breed of dog. Rather, it's a category. These pups were real racing hounds--some of whom were training for the Iditarod and other long-distance races. As you will see in the slideshow gallery, the dogs look very little like the Siberian Huskies we see walking down our streets. These dogs are much smaller and scrawnier (believe it or not). They have a very thick undercoat of fur--so much so that even in the pouring rain (and they did hang out right there in the rain), when you dug your hand under their fur it was warm and dry. The dogs are slender because they're all muscle and don't need to waste a lot of body energy packing on the fat. Siberian Huskies are actually way too large to be sled dogs. They're kind of scruffy-looking but are SO sweet and loving. In the winter the dogs live in the snow and race. Each racing team has 16 dogs (or they start with 16 dogs--some dogs drop out mid-race due to injury or other problems). During the summer they live in the coastal areas where it's cooler than the high temperatures inland. They still practice racing, but on wheeled sleds that hold 6 tourists and a musher. It kind of looks like a go-cart. In the summer they eat a protein-packed kibble. In the winter that's subsidized by bigass chunks of meat. Iditarod racing sounds really cool. The dogs are taken care of much better than the humans. 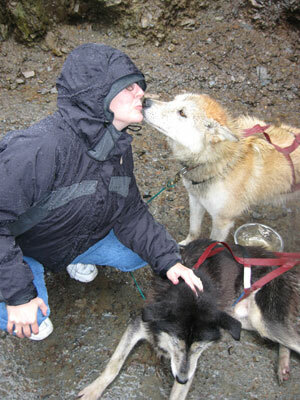 Each night the musher must stop at a checkpoint where the dogs are looked over by a vet. The musher must take care of their needs first--laying down straw for their bedding and making sure they're comfortable. There are only a few pieces of required equipment for mushers in the race--one of those being a sort-of camping stove to defrost the frozen chunks of meat that the doggies get to eat. Very little concern is given to what the humans actually eat--haha. The dogs average a speed of about 10 miles per hour but at top speed can get up to 25. Our wheeled sled was going about 10 and we were seriously booking! Actually, before the pictures *evil laugh* I will explain the last 3 shots, which are of Patsy Ann, the Official Greeter of Juneau, Alaska. Patsy Ann was a bull terrier who lived in Juneau in the 1930s. She was absolutely deaf, but despite that, she always knew when the ships were coming in and where exactly they would dock. She was never wrong. One time a crowd had gathered at a dock and Patsy Ann just looked at them and trotted over to another dock--sure enough, all those silly humans were in the wrong spot. Patsy Ann died in 1942 and a statue was placed in her honor right on the boat docks, still welcoming visitors today. Okay, on to the pictures. Click here for the slideshow! Inventory. For those of you who have worked retail, the word makes a shudder go through your body. For those of you who have never worked in retail, the word sounds like something you'd do to check with your internal feelings about an issue. The latter is far easier. This is my first time in retail and so I got roped into doing inventory. Inventory is where you count every single object in the entire store. Keep in mind that our store generates over 10 million dollars in revenue a year--you can imagine that's a lot of merchandise. Is it. My inventory shift was the final push. Others had been doing smaller inventory jobs but our crew (of 9) was to make sure that everything was indeed counted. The actual process was easier than I thought it was going to be. Each fixture had a handy bar-coded sticker (and by "fixture" I mean the actual fixtures on the floor in addition to individual bins and boxes on the shelves) and we had handy bar-code guns. You'd scan the fixture number in, then scan the SKU (price tag) of the item, then count said item and enter it in to the gun. Then you closed the fixture and had to re-enter the total number of items to make it balance. If it didn't balance you had to start over again. Concrete example. Let's say you have a bin of white tennis shoes. You'd scan in the fixture (bin), then scan the tennies and count them (let's say 10), then hit the close fixture button, enter the number of items in the bin (10), and you're done. However, it got complicated. You have a bin of white tennis shoes (10 of them), but also in the bin are some black loafers (say 6) which you have to scan and count, and unfortunately for you there are 2 pairs of purple sandals and 7 pairs of bunny slippers. So once you've scanned the tennies, the loafters, the purple sandals, and the bunny slippers, then you have to close the fixture and enter the total number of items in the bin--in this case it would be 10+6+2+7--25. So when you had multiple different items in a fixture, you had to keep a running total on a piece of scratch paper of the number of items you have counted, because of course once you've entered it, you can't go back and see it again. I had one nightmare bin--NIGHTMARE. The bin held very, very small items. 429 very, very small items, to be exact. They all needed to be counted individually. Worse--I had to count this bin THREE TIMES because I kept getting out of balance. Yes, I counted 1,287 items in a single bin. Yikes. We had to do this at night, of course. I started my shift at 10:00 pm and got home at 5:00 am. I went straight to bed but woke up at 10am this morning. I anticipate a nap in my very near future. Everyone knows that cruises involve food--lots and lots and lots of food. This cruise was no exception. There was, indeed, plenty of opportunities to eat. Every night there's a sit-down dinner (this information is for the non-cruisers). You can request the early seating (main seating) which is at..I don't know--not at 8:30 which is the late seating. We are obviously late seaters. You are assigned a table where you will eat for the rest of the cruise. Hopefully the people at your table are nice. Ours were. Well, 2 out of the 4 were. One was just really, really weird, and the other was his rather innocuous mother. The dinner is a real affair--menus, table service, the whole nine yards. The food is almost always delicious. I say almost always because I had an encounter with some quail that nearly made me cry. Fortunately our waiter brought me some steak (you get the same waiter every night too). Let's just say that when you order something and your waiter indicates that it's probably not a good idea, he's usually right. There's also a sit-down lunch in the restaurant but we only ate there once. We usually did lunch upstairs in the casual dining area. This is an area of the boat that's devoted to eating and swimming (which we didn't do). There are all kinds of buffets and things to eat--we tended to eat at the hamburger and hot dog bar and I did the pizza thing several times. You could also get sandwiches and various other buffet-type items (carved roast beef, for example, or salad). We ate up there in the mornings as well, at the waffle and pancake bar. The waffles were heavenly--made right there before your very eyes with all sorts of accoutrements. I was partial to the melted butter and cinnamon and sugar mix. Add to that an unending supply of bacon and you've pretty much got Shelby in heaven. I had lots of bacon. Lots and lots and lots of bacon. The eating was, as you might imagine, quite hedonistic. Kevin and I had an unspoken agreement that we weren't going to point out things while eating, such as, "I think you've got an entire pound of bacon there" and "is a fourth serving of bacon really a good idea?" In turn, I refrained from commenting about Kevin's dessert selections. That's what makes our marriage so strong. There is also a "special restaurant" aboard. The special restaurant requires reservations and is also a sit-down affair. It costs an additional $30 per person (all the other food is included) which sounds kind of silly given the amount of money you've paid to go on the cruise itself, but believe me, it is MORE than worth it. You are doted on at every turn by a number of waiters and the food is different than the menus you get in the regular restaurant. Additionally, they prepare things at your table (to the extent that they can. Sometimes "prepare things" means "cuts them up and puts them on a plate"). We went to the special restaurant twice. The first time we had the wine pairing menue--a fixed menu paired with carefully selected wines. Wonderful. Among other things we had a goat cheese souffle and a rack of lamb cooked in a puff pastry. And I'll eat pretty much anything in a puff pastry. Our second visit we chose off of the individual menu. It was tough because we wanted to try different things, but we couldn't resist a repeat performance of the chocolate souffle. My second entree was a roasted duck (quack quack) and let me tell you--it was the best duck I have ever had in my entire life. And I don't say that lightly. I'm a critic when it comes to food, but this duck was fabulous. Everyone has asked us about a midnight buffet. Unlike days of old, cruises don't really have a bigass buffet every night at midnight. Toward the end of the cruise they did do a Grand Buffet and let me tell you, it was grand. First they let you in to take pictures (that's how Grand it is) and then you can eat. The unfortunate thing is that if you have the late seating at dinner, we didn't leave the table until 10:00 or 10:30 some nights after chatting, and then the Grand Buffet started again at like 11:15. Basically we went, took pictures, and went to bed. I think they probably just shoved all of that food into the ocean--it was way too much for anyone to eat at that hour. So I think that about wraps up the food. There was a lot. We ate it. It was good. Also, bacon. Is your monitor dirty? Mine too! Fortunately I've found the best cleaner. Just click here! Pop, this one's for you! (not spam or spyware or anything horrible like that). Since we don't watch regular television, we do occasionally watch tv programs on dvd. In doing so, we have found that there is one sure thing--a really good program will be canceled far before its time. One of these programs is Futurama. It's a cartoon created by the guy who did The Simpsons, but is about 10,000 times better than The Simpsons, which of course doomed it to go off the air. However, Futurama is BACK! They are releasing a series of 4 feature-length movies straight to dvd, and those movies will be cut into 4 individual episodes and aired on Comedy Central after the movies come out. We in the Hogan household are very excited about this. Bender's Big Score is released on November 27th--pre-order your copy from Amazon now! Here's the official trailer. If you've never seen Futurama before (and you're local--let us know, we've got them all) you should know that most of the humor is a lot less scatological than this trailer. I clicked on Yahoo's homepage which is where I go for my news headlines, and their feature article was "Restaurant's Secret Menu." I immediately knew who they were talking about: In-N-Out, of course! That's it. That's the entire menu. Life is not hard at In-N-Out. Naturally you can specify your burger toppings. They are lettuce, tomato, "spread" (basically thousand island dressing), and onions, which you can get raw or grilled. That's a 20-by-20. Feel free to roll your eyes now. You can also get your burger "Animal Style" which is where they grill in mustard as they're cooking it, or a "Wish Burger" which has no meat--it just wishes it were a burger. And those are just a few of the choices. In-N-Out even makes fun of the legendary secret menu on their website here, but the funny thing is that those aren't all the secret items--there's more. I guess that's the secret-secret menu. I think this is a great ad, and sorely needed. Yes, it's sponsored by Dove, a skin-care product line--but at least someone is saying something. How Many People Can YOU Offend? Just about everyone in this clip. I love humor that tries to offend everyone.